Jonathon Gray departs Elgin Sheriff Court. A heated argument outside a house in Keith turned violent when a Huntly man pushed a woman to the ground. 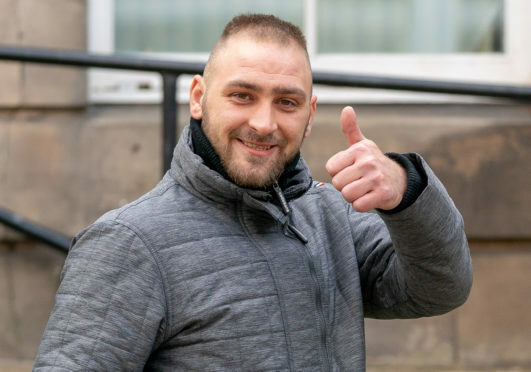 Jonathon Gray, 27, was at his home on Station Road in Keith when the female complainer, Lorna Buchanan, turned up at his property and wanted to continue an ongoing disagreement between the two of them. During this confrontation, Gray pushed her over and caused her to become injured. He said: “My client understands the repercussions of what happened with the push, but this situation has a long background. “Gray and his partner had an ongoing disagreement with the complainer and there were various messages sent by the complainer to the two of them. “When they didn’t respond, the complainer attended their house and asked for Gray to come out. Elgin Sheriff Court was told that the incident occurred at midnight on Sunday, August 13 last year. Mr O’Neill stated that although his client did have past convictions, he was in full-time employment and also had a long-term partner supporting him. He said: “Gray has been before the courts before but he is in full-time employment and has a long-term partner offering him support. “She has hearing difficulties and he acts as a carer and interpreter for her. Gray, of Castle Park Road in Huntly, pleaded guilty to assaulting Ms Buchanan by pushing her to the ground causing an injury. Sheriff George Aitken imposed a community payback order, putting Gray under supervision for a year.